A senior sharia official in al Qaeda in the Arabian Peninsula (AQAP), Harith al Nadhari, sets forth guidelines for “martyrdom,” or suicide, operations in a newly-released video. Al Nadhari’s video, which is more than ten minutes long, was released by Al Malahem Media, AQAP’s propaganda arm, via one of its official Twitter feeds. Tweets promoting the video include a hashtag in Arabic that reads, “#The Inviolability_of_Sacrosanct_Blood,” meaning Muslim blood. Al Qaeda and other jihadist organizations have attempted to rein in the violence unleashed by their members. Indiscriminate killings of civilians in the Muslim-majority world have, at times, damaged the jihadists’ cause by undermining their perceived legitimacy. Indeed, today’s jihadists have killed far more Muslims than non-Muslims throughout the history of their operations. AQAP has also had its operations against Houthis, who are Shiite Muslims, questioned. While AQAP is opposed to the Houthi rebels who have rocked Sanaa’s government, the group’s operations have generated additional controversy by hitting civilian gatherings. Nadhari clearly has these issues in mind as he addresses what AQAP, an official branch of al Qaeda, believes are proper restrictions on suicide attacks. Nadhari begins by saying that one of the “worst predicaments” a jihadist can find himself in is the “unjust shedding of inviolable blood.” Nadhari cites early Islamic literature and scholars throughout his video to buttress his point. Nadhari argues that “killing a believer” is more important in the eyes of Allah than the “end of the world.” He warns that hellfire awaits those who do not heed his warning. Because all will stand before Allah on the imagined day of judgment, Nadhari argues, jihadists cannot hide behind the orders of their leaders. Orders issued by one’s emir, or leader, should not be “considered a license to shed inviolable blood.” Both the emir and the one who follows his instructions will be thrown into hell, Nadhari says. Nadhari’s argument is the same one al Qaeda uses against the Islamic State, which al Qaeda accuses of spilling Muslim blood. AQAP’s ideologue goes on to set forth six recommendations, or guidelines, for conducting “martyrdom” attacks. First, jihadists should avoid using explosives or other methods “of mass killing” in mosques, markets, stadiums or other areas where Muslims congregate in large numbers. Second, Nadhari says that jihadists should avoid killing Muslims even if they are being used to shield their enemies. Only in “extreme” circumstances, with guidance from “highly knowledgeable” scholars, should jihadists carry out such operations, Nadhari says. Sixth, and finally, Nadhari says that suicide operatives are at fault if they attack without “wisdom,” even if their intentions were good. AQAP is clearly concerned about how the jihadists’ operations are perceived throughout the Muslim-majority world. And Nadhari’s guidelines demonstrate, once again, that al Qaeda continues to believe that the jihadists’ indiscriminate violence remains a strategic liability for their cause. Nadhari praised the attack on Charlie Hebdo’s offices earlier this month. 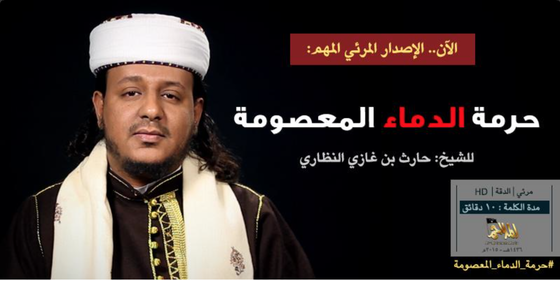 Another AQAP ideologue subsequently claimed responsibility for the massacre on behalf of the organization. In addition to the Charlie Hebdo attack, Nadhari regularly comments on events far from Yemen. In August 2013, he discussed the turmoil in Egypt. In July 2014, Nadhari joined other senior AQAP leaders in defending Ayman al Zawahiri and veteran jihadist ideologues against their critics. Nadhari’s message was clearly aimed at supporters of the Islamic State, an al Qaeda offshoot that claims to rule as a “caliphate” over large parts of Iraq and Syria. And in October 2014 he was among the al Qaeda ideologues who attempted to portray the US-led bombing campaign in Iraq and Syria as part of a “Crusade” against the Islamic world. It is possible that Nadhari also serves as one of Nasir al Wuhayshi’s deputy general managers in al Qaeda’s global network. Documents recovered in Osama bin Laden’s compound show that al Qaeda’s general manager has deputies who are appointed to help him carry out his work. Nasir al Wuhayshi serves as both AQAP’s emir and as al Qaeda’s general manager, but his deputies have not been publicly identified. Haven’t read the article yet. My first impression is that the story is from the Onion. LOL, what a rediculous defeatist campaign YOU LOOSE! I am sure Nadhari will step right up there and martyr himself. I guess he also outed several prior suicide bombers of going to the hellfire instead of the virgins since they didn’t follow the rules. I don’t think they knew that. They were mislead and still are as well all all the jihadis that are out there killing people. Religious leaders have always refused to make an example out of themselves, to step up to the plate, make a real example and show people how it’s done. But apparently, even mentioning this very fact in 2015 means that people that think like me must be punished. We are in the midst of an attempted revival of all religions, and groups like AQAP will only benefit from the numerous cannon fodder and cognitive dissonance that willingly comes their way and signs up to throw their lives away.